Cincinnati Bearcats vs Temple: A Football History — OhVarsity! Note: This was originally published during the 2016 season. I’ve dusted it off and updated it for 2018. Your Cincinnati Bearcats are on fire, but you know that. An improbable 6-0 start has catapulted UC into the Top 20 of the AP Poll for the first time in nine years. Here is where things will get interesting. I’ve been talking about it since August, but the second half of the schedule is daunting for Cincinnati. Aside from the big game against UCLA and some “tricky” matchups with teams like Ohio and Tulane, the first six games didn’t demand much from the Bearcats. Now UC must win two conference games on the road before returning home to face a Navy team that steamrolled them with 622 yards of offense a year ago. After that they’ll face #21 USF (undefeated) and #10 UCF (undefeated). Like I said, things are serious. Saturday’s game against Temple is where the proverbial road to glory starts. Games between the Bearcats and Owls always feel important, and I’ll write more on that at the end of this post. Until then, here’s a rundown of the history Cincinnati and Temple share, including a look at some of the series’ noteworthy games. The Owls entered the 1974 meeting at 6–0 on the year, sitting at #19 in the AP Poll. It was their first time in the rankings in more than 33 years, and they were riding high. They had won 14 consecutive games dating back to the 1973 season. Basically, they were good. 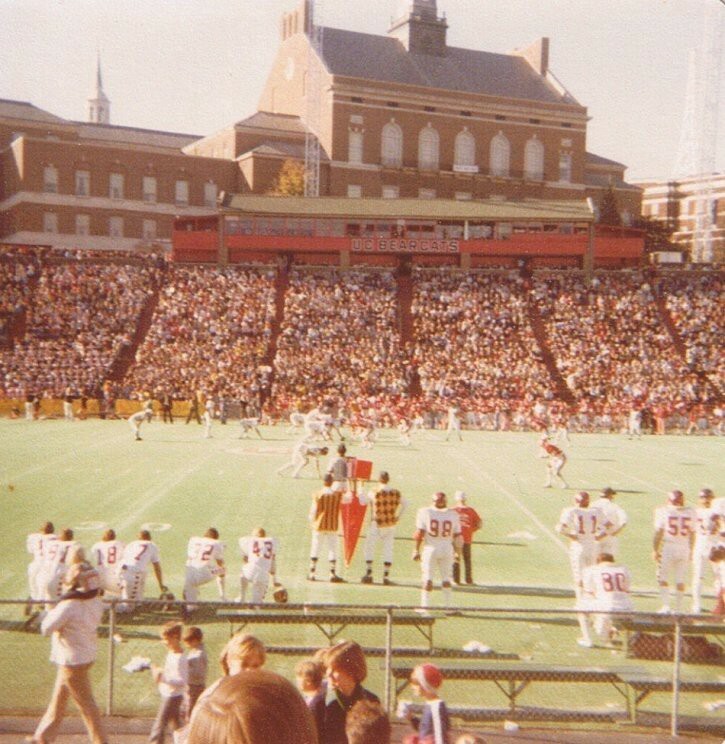 On November 2, they entered Nippert Stadium for Homecoming, looking to squash a team that went 4–7 the previous year and entered this game at 3–3. The Owls thought they had a sure victory. Temple struck first, scoring on their first drive of the game. I’m sure it felt like the start of a long day, but the Bearcats immediately responded with a touchdown of their own, and the battle was on. The ‘Cats held the lead in the fourth quarter until Temple QB Steve Joachim (who’d already thrown four interceptions) led an 11-play, 79-yard drive that gave the Owls a 20-19 lead with just 2:24 remaining. For a Cincy team without a quick-fire offense, the two-minute drill to win seemed unlikely, especially if had to end with walk-on kicker Dan Shepherd taking a shot at a game-winning field goal. He’d already missed an extra point in the first quarter. However, the Bearcats took off down the Nippert Stadium Astroturf, once nearly losing the ball on a fumble, and moved the chains to the 15-yard line on a diving catch by current UC radio analyst Jim Kelly. After a Temple false start nullified Shepherd’s first attempt, the re-kick from 26 yards out soared through the uprights and 18,303 fans at Nippert went nuts. Entering the ’77 matchup, the series had been remarkably evenly matched. Temple won the first meeting by a single point, the Bearcats beat the #19 Owls by a point the following year, and Temple won a four-point game in 1975. In 1977, Temple returned to Nippert for the first time since UC’s monumental upset in ’74, and the two teams did the only thing possible: They played to a 17–17 tie. The Owls finished the season 5–5–1 and UC wound up at 5–4–2, having tied with Louisville by an identical 17–17 score that September. Through the late ’70s and early ’80s, the Owls had a stranglehold on the series, and entered 1985 having won six of the previous seven matchups. UC started strong and came from behind in the first half to mount a 10–7 lead at the break. However, with the help of a pick six, the Owls outscored UC 21–6 in the second half to steal a win, sending the Bearcats to their third straight loss after a 3–0 start. Temple had started the ’85 season 0–3, and the Bearcats were their second consecutive victory en route to a 4–7 season. The Owls would have to wait a while for their next meeting with the Bearcats, and even longer for their next win at Nippert. The Bearcats and Owls played in 2002 and 2003 when Temple was a member of the Big East. The Conference USA Bearcats won both meetings in a short home-and-home series. In 2012, Temple re-joined the Big East (having previously been kicked out) and faced the Bearcats, still searching for their first series victory since 1985. A woeful Owl offense, led by quarterbacks Chris Coyer and Clinton Granger, was no match for a Bearcats team that entered 6–2. Brendon Kay tossed a pair of touchdowns, George Winn chipped in two more on the ground, and the Bearcats rolled to a 34–10 win in Philly, their largest margin of victory in series history. Temple finished 4–7 that season and the Bearcats landed at 10–3 to claim a share of the Big East title. After a 2014 meeting that saw the Bearcats put together a dazzling defensive effort in a 14–6 win, 2015 couldn’t have gone more poorly. Temple had sprung a 27–10 upset on Penn State the previous week and headed to Nippert hoping to legitimize what many saw as the best Owls team in years. Instead, they sat back and let the Bearcats beat themselves, mounting a 34–12 lead on the back of three interceptions by Gunner Kiel and a special teams breakdown to start the second half that allowed a 100-yard kickoff return for a touchdown. The Bearcats didn’t go quietly, and mounted a furious comeback late, only to have a fourth Kiel interception end the game on a 1st-and-goal with a chance for Cincinnati to tie. For a team that was projected to compete for the conference title, it was an ominous start that proved to be indicative of what was to come. The Bearcats finished 7–6, 4–4 in the conference. Temple rumbled to a 10–4 season after an AAC Championship Game loss to Houston. In hindsight, this was one of the most depressing games I’ve seen at Nippert, and gave us the first peek at the cracks in the foundation of the Tuberville era. Although I’ve seen UC beaten more soundly, it’s hard to forget the way this one felt. It’s funny. The Temple game has served as a watershed moment for years. In 2013, UC played their first ever AAC game against Temple in the conference’s first season. Brendon Kay’s stellar 31-for-37 performance propelled Cincinnati to a 38-20 victory over a hapless Owls team that finished 2-10. In 2014, the Bearcats road tripped to Philly in need of a late-season victory to help secure a share of the AAC championship. They turned in a fantastic defensive effort to win 14-6 and won the conference title with a home victory over Houston a week later. In 2015, Temple came to Nippert for the conference opener in the second game of the season. What could’ve been the first step towards a second consecutive conference championship blew up in the Bearcats’ face, as Kiel threw four interceptions, including one on in the end zone on the potential game-tying drive. It was the beginning of the end for both Kiel’s career as a starter and Tuberville’s tenure as head coach in Clifton. In 2016, the Bearcats opened with a shaky start. After two early victories, UC was just 3-3 entering Homecoming, Kiel had lost the starting job, and fans started to sense chaos. Gunner got the nod in Clifton and an impressive showing against ECU got Cincy back over .500 with a big road game against Temple looming. I even wrote a preview on the matchup and what it meant for Kiel, which I never do, because it felt like such a huge moment. A Kiel fumble early set up an Owls touchdown, and it only got worse from there. Temple won 34-13 and Tuberville wouldn’t win again as head coach. UC lost their final five games, at one point not scoring a touchdown for more than 11 straight quarters, and finished 4-8. In 2017, a loss to Temple on a frigid Friday night at Nippert gave UC their seventh loss, ending hopes for a bowl game in Luke Fickell’s first year. I don’t expect this year’s matchup to be quite as dramatic as some of those. A loss here won’t signal a downward spiral for Fickell and a win in October won’t be the penultimate victory on the road to a conference title. However, this could be UC’s biggest game since that fateful 2016 matchup. At least this season, I think there’s a big difference between 7-0 and 6-1. It’s UC’s first real test of the conference slate, and the first challenge 0f a tougher second half of the schedule. It’ll be their first game in two weeks because of the bye, so let’s hope the ‘Cats can keep the train rolling.